Session attendees will learn how the hot topic of unconscious bias applies to instructional design and facilitation—and how to be more inclusive in learning materials and delivery. 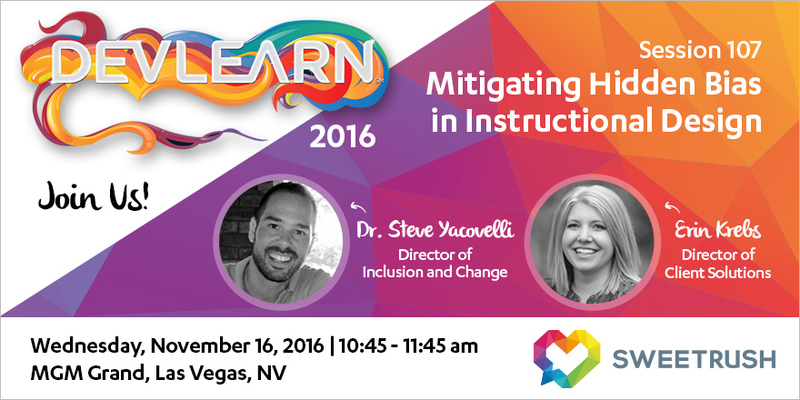 San Francisco, California, November 7, 2016—SweetRush is proud to announce the session “Mitigating Hidden Bias in Instructional Design,” on the important topic of unconscious bias, at 10:45 a.m. Wednesday, November 16, at the DevLearn 2016 Conference & Expo in Las Vegas. Dr. Steve Yacovelli, SweetRush’s Director of Inclusion and Change and an expert in diversity and inclusion, will present the session along with Erin Krebs, SweetRush’s Director of Client Solutions. Steve and Erin will also participate in DemoFest, part of the DevLearn conference, sharing an award-winning serious game developed for a Millennial audience. Learn more about both speakers below. The DevLearn 2016 Conference & Expo, produced by The eLearning Guild, is one of the most attended and anticipated events for the learning and development industry. It will take place November 16 to 18 in Las Vegas, Nevada. To register for the conference and learn more about DemoFest, visit the DevLearn 2016 website. Steve’s many areas of expertise include change management, diversity and inclusion consulting, instructional design, leadership and cultural development, learning strategies, and training evaluation. A published author, Steve’s writings focus on organizational and individual adoption of change, how adults learn using technology, and organizational readiness for technology-enabled learning. Erin heads up our talented Solution Architect Group. Whip-smart, with an ability to capture the big picture and the details, she crafts solutions that go beyond her clients’ expectations. Erin holds a master’s degree in learning systems design and development and is a certified professional in learning and performance. She’s a speaker and author on numerous topics, specializing in learning techniques for Millennials.